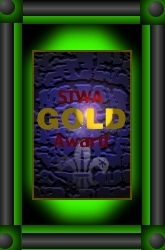 Scouting The Web "Gold" Award with Technical Distinction! Gold is an Excellent, Outstanding site where it can be seen that the Webmaster, Troop, and Scoutmaster has worked to make this site a success. A very easy and nice navigation interface. Very fast loading pages. A HUGE amount of content, resources, etc. Contacts. Scouting links. Possibly 2 styles of languages to view the site. This level is a true honor to receive since there has never been a site in world that have this level of our award! STWA does not give many bonus points for having flash, shockwave, Java/applets, music, etc. on your site, since some users may not be able to use them and they take a long time to load on your visitor's computers. This award is above content and includes Technical Distinction. The page can not be made with web authoring tools such as Front Page(TM). The site must meet all the qualifications for the Gold STWA to even be considered for the Gold with Technical Distinction!.